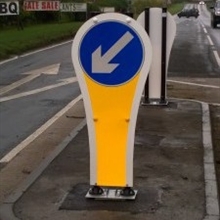 Available in heights of up to 1450mm the MegaFlecta is an impact resistant sign/bollard ideal for use in Traffic Islands, Traffic Calming Schemes, 2 Plus 1 Lane systems and is ideal for use on high speed roadways. Providing regulatory signage from 450mm to 750mm diameter, the Megaflecta is available as both a single and double aspect sign. 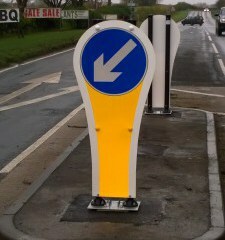 Mounted on a unique base system to support the double or triple post assembly the signs are simply attached to the supporting cast-in cage system at the time of installation.